The 86th Scripps National Spelling Bee begins today. Check ESPN listings to play along. This year's competition includes a new challenge; multiple choice vocabulary. Here's some study tips for success. 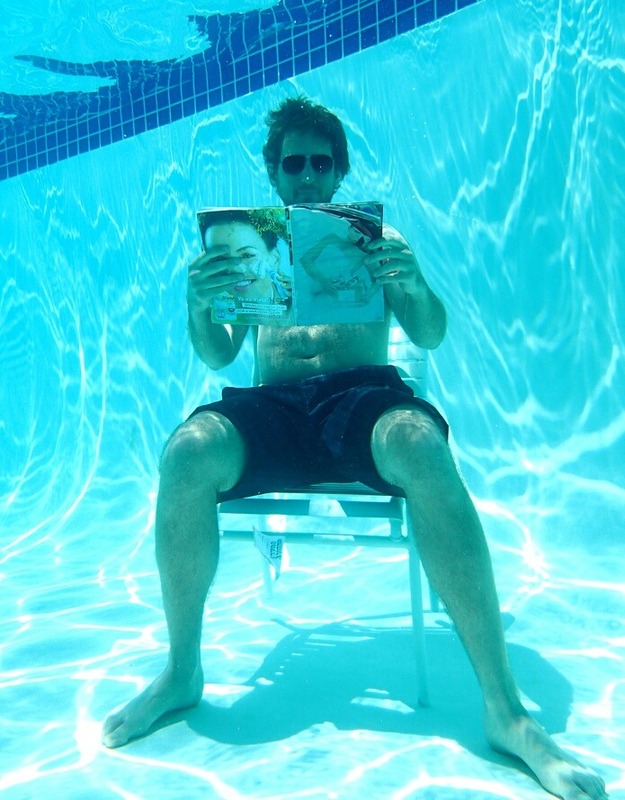 You guessed it - #8 is reading. Those serving the military don’t often have access to books. Books provide a link to home, entertainment, an escape from the loneliness of deployment. Books for Soldiers was started by Storm Williams to provide books, CDs, DVDs to our troops. The Alpharetta Friends group collects books, etc. along with goodies, snacks, and letters to send to those serving worldwide. Operation Paperback provides books to military and veterans hospitals in the United States, USO centers at US Airport transit points, as well as overseas. They’ve recently added a program that provides books to military families. The non-profit Johns Creek Veterans Association has embarked upon a grassroots and historic mission to build a world-class memorial dedicated to all veterans, their families and supporters in a quiet, wooded section of the City’s flagship public green space - Newtown Park. We invite you to join us to create a lasting, living Johns Creek landmark for future generations. Donations of any size are welcome – for the walkway, monuments, park benches, entrance plaza, gazebo, and engraved pavers. The Teen Summer Reading Kick-Off is 6 June at 11 a.m. Bring a friend and learn about the Summer Reading Programs. Activities such as Henna Tattooing, Decorate Flip Flops, Duct Tape Crafts, and Bridge Camp are among June offerings at Ocee. Pick up a copy of access at the Circulation Desk for program descriptions/schedules. For more information or to register call 770-360-8897 ext. 253. Our sister library, Northeast/Spruill Oaks, teens’ summer programming includes: Sundays for Teens Series (writers' club, poetry, book club, public speaking), Tuesdays for Teens Series (improv! and yoga), and a Summer Business Series. All programs require registration and some have limited space. Call 770.360.8820. Sliding can be a blast - until you've got to climb back up to the top! “Slide” refers to the loss of academic skills and knowledge that typically happens to students over summer break. This occurs across all subjects and for some, the backwards “slide” can be equivalent to an entire grade level. Studies show a little summer reading goes a long way toward success in the classroom. Visit library to prevent slide and have fun, too! Just Read It Book Club (ages 9-12). Jump and Jam with Miss Gail and the Jumpin’ Jam Band. access lists program descriptions and schedules for all AFPL branches and available at the Circulation Desk; as is the Ocee calendar. Check AFPL events page. Many of Ocee’s programs have limited space and require registration. For information call 770.360.8897. Richards’ autobiography, Life, is available in paper, audio, and e-book though the AFPL. 007 marked his 50th year in the movies with the November 2012 release of Skyfall. Which of the Bond novels just celebrated its 60th anniversary? Get Low with Robert Duvall, Bill Murray, Sissy Spacek, and Lucas Black is loosely based on a true story. The movie used locations in and around Atlanta. We know that physical exercise is important for healthy aging, but so is staying mentally active and curious, as well as making and keeping social connections. 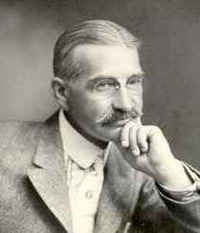 Today is the birthday of L Frank Baum, author of The Wonderful Wizard of Oz. Baum never graduated school or lived in Kansas. He was father to 4 boys. He worked numerous jobs; including actor, salesman, and raising fancy chickens before writing his uniquely American fairy tale at age 40. 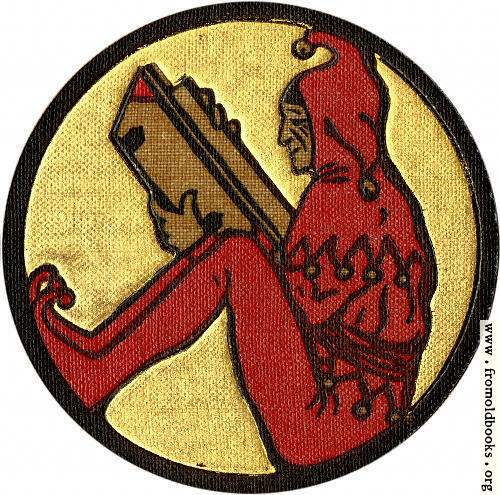 His partnership with illustrator, W W Denslow, proved to be a winning combination. 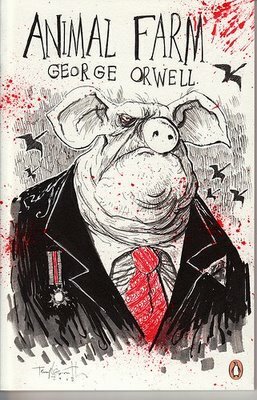 13 more Oz books followed with artwork by John R Neill. With rapidly changing technology and trends, some materials become quickly out of date and outlive their purpose. Truly old books may warrant an online search or a consult with a used bookseller or antiques dealer for a valuation. You may find a niche market (and a little extra cash) for vintage books and music on site like ebay or etsy. Vinyl records, VHS, and cassette tapes are accepted at Goodwill. Organisations that serve the visually impaired may (please ask first) accept books on cassette tape for their clients. Better World Books has drop boxes in the area. Soemtimes, books may serve a better purpose in another form; please consider recycling. If you don’t have curbside recycling service, take them to Roswell Recycling. Webb Bridge Middle School recycles as well. 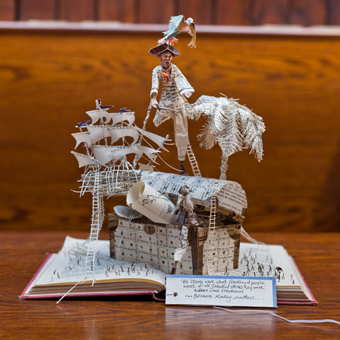 "Artfully" recycle by entering Ocee Library’s altered books contest (see 8 May post). Express yourself! Ocee Library is having an altered book contest for ages 8 and up. An altered book is one that has been artistically collaged, rubber stamped, cut/carved, painted, folded, or otherwise embellished. This is a fun, creative way to repurpose old or out-of-date books that might be headed for the recycling bin. You're only limited by your imagination! The 1st place winner will receive an Amazon gift card and a ribbon. 2nd and 3rd place recipients will also be awarded ribbons. 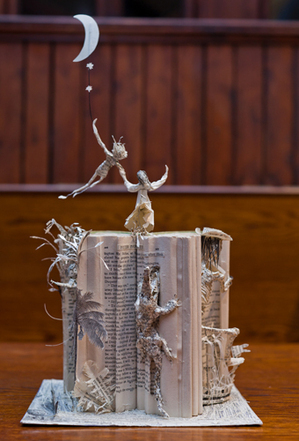 Altered books will be displayed in the library. The deadline to submit your artwork is Friday 26 July. For more information call 770-860-8897. Now accepting book donations - CDs and DVDs, too! You can view an illustrated 1916 copy or Mother Gosse in Prose by Frank L Baum (Oz author) on-line. Visit the AFPL catalogue for contemporary verisons like The Top Secret Files of Mother Goose and Jaha and Jamil Went Down the Hill: an African Mother Goose. 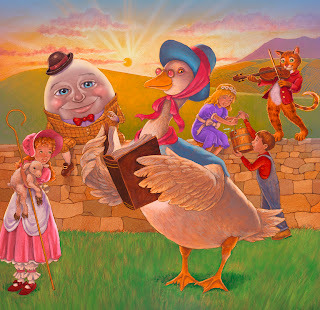 History buffs might enjoy scholarly research that examines who Mother Goose was, explores the social & political uses of the rhymes and Mother Goose in advertising.